According to Investor’s Intelligence, newsletter editors are pretty much were they were when we did an overview of sentiment last week. With 36% bullish and 37% bearish, we continue to have very good grounds for a rally. Similarly, the AAII survey shows 37% bullish and 39% bearish. It is interesting to see these two (II and AAII) sentiment gauges now paralleling each other. It wasn’t that long ago that they were sending mixed messages and everyone, including me, was trying to make sense of it. Consensus, which was showing the lowest bullish readings since 5 years ago, recovered to 27% but is still in extremely bullish territory. One indicator which is blinking red against the bullish scenario is the NYSE odd lot short sales. These are small amounts of stocks which have been sold short. Since retail investors or traders are usually behind these, it is safe to assume that no complex hedging strategy is behind it. But rather, their expectation is that the market will fall. 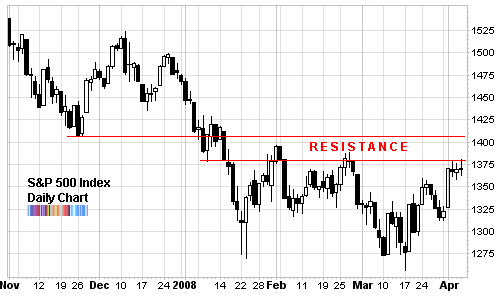 Right below the tenacious resistance levels at 1400 which have repelled previous rallies. I don’t pretend to know where the market is headed but the best case for the bulls would be a pause just under that resistance level, and then another assault to break through the barrier and go higher. If you squint you may notice that there are technically lower highs and lower lows. Of course we have the December 2007 swing high, then the early February 2008 top, followed by the late February 2008 top, and then finally where we are now. If it turns into another top… well, that would be very messy for the best laid bullish plans. 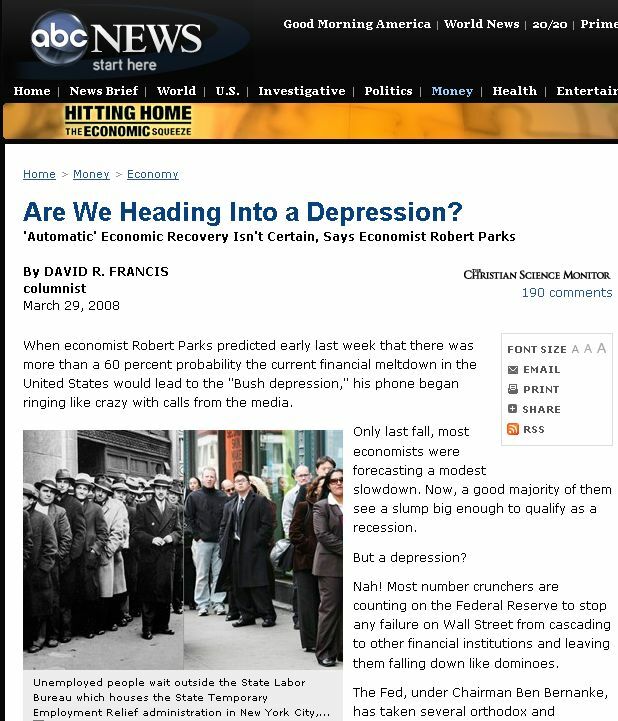 Here’s an interesting headline from ABC News: “Are We Heading Into a Depression?” It juxtaposes the infamous image of the depression in our minds with that of today. Before you rush out to buy cans of preserves and stock-up on cheese, remember that it is much easier for the media to sell fear and gloom than positive news. And that from a contrarian perspective, such bombastic headlines are actually precursors of better times ahead. And by no means is the above example an isolated case. The media is replete with such stories. Just a few days ago I showed a BusinessWeek article which immediately called into question the nascent recovery in the stock market. Im CEO and Portfolio manager of http://thetechnicaltrader.net . Just inquiring if you would be interested in our affiliate program which involves placing a link/banner on your site. I charge fees for my service based on 3 trading plans. 1yr, 6month, and month subscriptions. Commissions on your behalf are as follows/sale. Based on sales made as a result of clicks from your site. I see that the daily new 52 week highs have outnumbered the 52 week lows for the last 2 trading days. This has been a rare occurrence in the past several months. It is also nice bullish confirmation on 2 neutral market days. We should see more of this if this upsurge is going to continue, as I believe it will. Now that we have broken through the 50DMA on the upside I think it will provide resistance in the near term and be the place to buy at for those late to the party. I also think 1406 will be the near term top and will provide resistance for a while. I think a bounce off around 1400-1406 is a great place to sell this rally and buy back at the 50DMA when we come back down. I meant to say I think the 50DMA (on the S&P 500) will be support in the near term not resistance.